In “Red Dead Redemption 2,” the third in Rockstar Games’ epic gunslinger video game series, gang leader Dutch van der Linde reminds our protagonist that his band of misfits “feed them who need feedin,’ save them who need savin’ and kill them who need killin.’” Honda’s new Passport crossover, also the third in the series, similarly gives buyers whatever they need most, and nothing more. You want to go off-road? Honda’s i-VTM all-wheel-drive setup systematically puts power to whatever tires needs powerin’. On road? Its 280-hp V6 and standard 20-inch wheels provide speed and handlin'. And if you need cargo space, the Passport has you covered there too. It beats all in its class, except the Toyota 4Runner, in space for stuff. Hopefully the new Passport, on sale in February, won’t meet an ending like poor Arthur Morgan and the rest of the van der Linde crew. The last Honda Passport went out in 2002, not with a bang, but with a whimper. It suffered from severe rust corrosion on the rear suspension lower links, and almost 150,000 were recalled. It was a decent-looking SUV that shared a platform, and pretty much everything else, with the Isuzu Rodeo SUV. In that respect, the last one did sort of go out like Morgan. Sorry, no spoilers! The new Passport shares its front two-thirds with the three-row Honda Pilot, along with its platform and wheelbase. It’s 6 inches shorter front to back, 1 inch taller and about 1 inch higher off the ground. It’s by far the most aggressive-looking crossover from Honda, with a dark grille matching dark wheels. With a roof basket or kayak on top, it looks positively mountain-ready. It wouldn’t have taken the van der Lindes 10 hours of real time (!) to get down from the Rockies if they had a Passport instead of hungry horses. How much do a couple of wagons and supplies weigh anyway? Probably less than 5,000 pounds, which is what the Passport can tow. Honda’s proven 3.5-liter V6 makes 262 lb-ft of torque along with those 280 ponies. Output is transferred to a new-ish nine-speed transmission, through the all-wheel drive system and to the wheels. The Passport is FWD-based but can send up to 70 percent of the power to the rear. And all of that can be sent to either side depending on the situation. Drive modes (normal, snow, mud and sand) alter the throttle sensitivity, shift map, rear bias, torque vectoring and stability control, though I never figured out how to turn the traction control completely off. There was a “get unstuck” mode, but that’s it. But don’t expect that to happen too much, the Passport has an approach angle of 21.4 degrees, departure angle of 27.7 degrees and a breakover angle of 17.3 degrees. That will get you up and over anything short of a basketball-sized boulder. Ride height is 7.2 inches for two-wheel drive models, 8.1 for AWD vehicles. The Honda Sensing suite of safety features is now standard across the trims. It includes emergency braking, road departure mitigation, adaptive cruise control, lane keeping assist and traffic sign recognition. And sure enough, with ACC on I could let go of the wheel for a few seconds and watch it turn with the road before it instructs me to take control. The Sport trim starts at about $32K, top Elite models start around $44K. All-wheel drive is standard on the Elite and $1,900 extra on the lower trims. A draft horse, by the way, comes standard with all-leg drive. The dark grille and wheels (on Sport and Elite trims -- I drove the Elite) help the Passport stand out from the more family-oriented Pilot. You probably wouldn’t notice the 6-inch size difference unless you put them next to each other either. There are a couple different wheel designs, all 20 inches, though Touring and Elite wheels are a tad (245 to 265) wider. The trim structure should be familiar to Honda fans: Sport, EX-L, Touring and Elite. EX-L and above get a power liftgate. The Passport comes in eight colors, the most important of which is black forest pearl, a sweet dark green. Black copper pearl -- think of a penny, but better -- would be my next choice. Inside, again it looks very Honda-like and very Pilot-like. That means a black perforated leather wheel, perforated leather seats, black rubbery plastic on the dash and black plastic plastic on the doors and pillars. There’s also a gray option, but the headliner remains black. EX-Ls and above get a power moonroof. The seats are comfortable, if a little firm and rear seat space is great with plenty of kneeroom. There are also a bunch of cubbies in the doors and center console to store stuff out of sight. The cargo area too, features underfloor space for extra special items. On the tech side you get an 8-inch central display screen pinned between the central heat vents and upgraded models get a 7-inch digital screen where the gauge cluster would normally be. That one is customizable to show audio stuff, miles, drive modes and AWD power dispersal. I don’t like the push button shifter system Honda uses, but that’s your only option. On the super smooth but chilly Colorado and Utah roads we drove, the Passport proved quiet and soft. When the roads did get rough Honda’s four corner independent suspension made no squeaks or rattles, even when we found the suspension bump stops on a particularly rough off-road spot. Far better than wooden wagon wheels, or horses. Like the van der Lindes, the Passport offers only what a driver needs and nothing more. That means no skid plates, no center differential and no hill descent control. 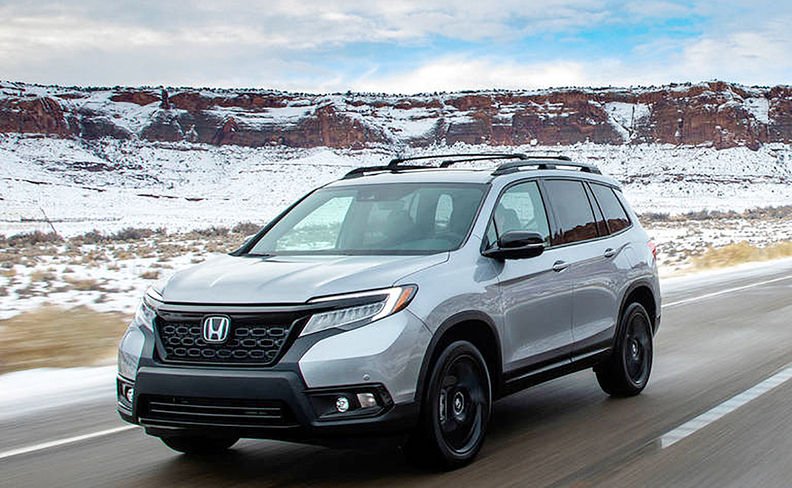 That last one is a “maybe” on the need list, but Honda’s i-VTM all-wheel drive system had zero trouble with the medium-technical trails that we took through the former Wild West around Arches National Park. I did see steer and deer, but unfortunately no bears. Over the faster washboard stuff the light off-roader jiggled, but never complained. Besides the suspension, we did bottom out a few times, hitting some anonymous metal part underneath, but nothing was ever damaged, and my driving partner and I trundled on. The suspension feels stiffer than expected for this size crossover, stiffer than the Pilot for sure, but it never beat me up, except on some of the trails. On trail or off, Honda’s V6 and second generation nine-speed automatic handled everything with aplomb. The best thing I can say about an automatic transmission is that it isn’t annoying, and that’s what I’ll say here. It didn’t hang up or feel like too many speeds. Besides the terrain modes mentioned above, you can swap drive for sport mode and hang on to gears a little longer. The brake pedal has surprisingly good feel and is easy to modulate. The throttle, like all Hondas, is a little too easy. The steering too, is light, but that’s fine for this application. Honda says the Passport's ratio is also quicker than the Pilot, but that's hard to discern. On high speed, snow melted, red muddy trails it sloshes around, sometimes feeling a little out of control, though I never put a wheel off a trail. Sight lines are generally good, but there’s no front camera, necessitating a few leans out of the window. I’ve never been in the high desert in winter. It’s different -- quieter this time of year. I sometimes try to judge the distance to the next mountain range, thinking about what it must have been like to traverse this land before motorized vehicles. It’s a miracle we made to the Rockies, let alone the coast. But really, that’s exactly what this Passport is for: mostly on-road long-distance travel. However, if the mood strikes you, pack up a sleep roll, some canned beans and your six shooter, head out west, or down south, or anywhere with some trails and terrain, and get lost. You might not find new land to settle, but like Morgan, John Marston, Dutch and the rest, you’ll definitely come back with a story to tell.